A reconstruction of a typical antique Family home were the grandmother sold milk, became our Bed & Breakfast Me.Fra thanks to the careful management Me.Fra offers it’s guests warmth, passion for the place and fantasy that only a young and dynamic staff can give. Atrani hits : emotions and seduces not only for the views and the sea, but also for the flavours and tastes of this cuisine. Plenty of blue fish, exquisite the “pasticciotto” cake with a cream and black cherry filling, traditional “sarchiapone” a long pumpkin prepared like cannelloni. Much appreciated the D.o.c. wines of Ravello, Tramonti and Furore. Amalfitana lemons typical of the coast, especially in cakes or rinds of citrus fruits covered in dark chocolate. 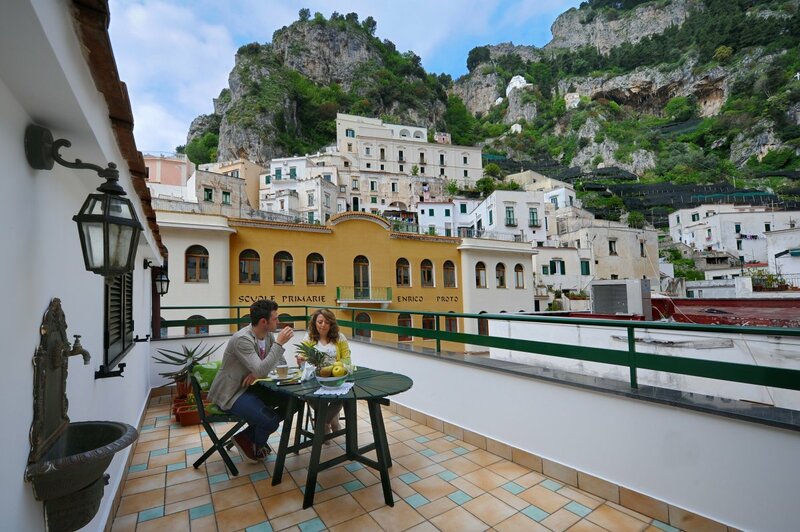 Dine in one at the five restaurants that Atrani has to offer. Chi siamo A pleasurable walk through the white alleyways, this village is rich of medieval architecture and a precious testimony of art. The most significant being the church of St Salvatore de Birecto in the main square. At the time of the republic of Amalfi the church was the palatine chapel where Dukes were crowned and where their ashes were kept. At the top of Mount Aureo, the church of St Maria del Bando so called due to the legend telling that the lady bestowed grace to a man “bandit” unjustly condemned to be hanged. Nearby the “Masaniello’s Cave” ware Masaniello, a revolutionary took refuge while being hunted by Neapolitan viceron’s soldiers. On the opposite side, at Mount Civita, is the most antique church of “St Michele Arcangelo”. The church was used as a cemetery up to 1927 an was a real common grave during the 1656 plague. Near is the church of the “Madonna del Carmine”. This church keeps a 16th century Christmas nativity. Whose characters are faithful reproductions of Atranian man and women of that age. The main church “ Collegiata of the St Maria Maddalena penitente” (city patron) was founded in 1274 on the ruins of medieval fortress thanks to the wil of the Atranians who wanted to thank the Saint for freeing them from an invasion of Saraceni soldiers.